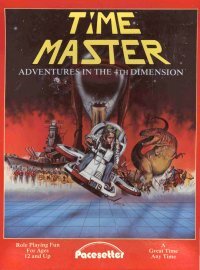 Goblinoid Games are publishing facsimile copies of Pacesetter's Time Master series. Time for another gaming flashback...! In my own playing circle, back in the day, nineteen-eighty-(vague mumbling), I seem to have been the only one out my friends to own a Pacesetter game. Like Palladium and Chaosium, Pacesetter used a similar percentage based games mechanic in their products. I never bought Chill. My Call of Cthulhu friends were happy a 1930's SAN-check for pretty much anything encountered -even if werewolves and vampires weren't officially part of the Mythos (*crosses self and thumbs the broken talisman*). It's remembering that when these games came out that there was a bit of a jostle for the different genres - unless the game came with a very specific setting. Near Time Master on the shelves in my local shop was the FASA Doctor Who RPG. To myself, at the time, that game would've been very restrictive with the characters you get to play and how much you had to know and the Doctor Who universe -and so I never bought it. That was it for time-travel themed games for me at the time. This however didn't stop White Dwarf and Imagine (UK's version of Dragon magazine) fill it's pages with articles about time travel in D&D, Judge Dredd, CoC and, naturally, Star Trek. Grandfather paradoxes aplenty, time travel looked fun but pretty unplayable. Time Master, however, did a good job of setting clear guidelines as to how to make time travel work. You're Time Agents - fix the problems, apprehend the criminals, preserve the order. Time is a very mutable thing. Success and failure would be measured in terms of the "significance" of adventure goals on the rest of history (based on a points system). History had a way of healing itself, the trick was minimising the damage. For example, no matter what you did, the earth would be engulfed in a nuclear apocalypse at some point in late 20th to mid 21st Century, but the superpowers-combatants may have actually changed in nationality. Maybe Hitler wins WWII and the Cold War is between just Europe and Russia, but eventually America is dragged into WWIII. The guidelines for this is pretty good. Even dropping a gun in the wrong time-period has a "Significance Rating". Any mistakes or failures are counted up against more general goals, making sure that a historical event actual takes place can outweigh the smaller problems. On top of that, the rules include a comprehensive mass combat system with counters, which actually allow you to fight battles in history. Again, losing a battle, when in history it's actually won, may still not disrupt the time-line much - a war may drag on for a few more months with the same overall result, alternatively a catastrophe may occur with the time-line not getting back on track for 500 years. Then you have to think "Well, the whole 16th-21st Century were ruined, as long as Earth still joins the Interstellar Community in the 24th Century, the Time Corp HQ in the 72nd century won't actually get erased". Dominoes. There is an open feel and yet a totality about the rules in Time Master. It's limitations seem to depend upon how your own perceptions of sci-fi and science. For example, PCs are enlisted from any point in history, but are discouraged from entering their own time - which closes quite a few interesting doors. Also the rules for futuristic weapons seem to be limited to Space-fighters, a laser gun and laser rifle. Hmm. There's a lot of time between here and the 72nd century. Creativity is required on behalf of the Referee in terms of small details. The emphasis is often on famous people or royals from history plus an wanted element - a "Demorean" (multiple armed xenophobic perfectist interdimensional aliens) or just some time-travel-renegade, a mercenary from the "Time-Wars". preserving life and time-line event order. The problem is that it can all read like a pantomime comedy in period costume. Did I mention that despite the extra limbs, that bad-guy-evil Demoreans can shape-shift? Masquerading as our leaders!? The Horror! When I was younger I struggled a lot with the sweeping generalisations about history in Time Master which seemed at odds with fairly detailed battlefield simulations. I was utterly tied in knots about actually getting down to play Time Master. Doctor Who... spitfires in space? However, since the TV series Doctor Who went utterly crazy, I'm feeling less worried about Churchill punching out aliens and lasers at the Somme. 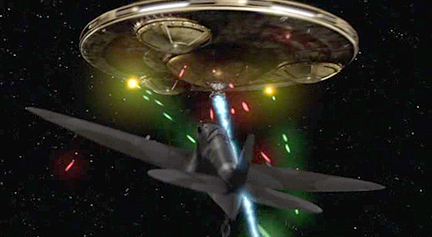 And yes, you could probably do the "spitfires in space" thing but the debriefing back at the Time Corps would be really tough. Oh, and another thing - the Chronoscooters can only jump in and then jump back from one time - no time-hopping. In one of the modules they throw that out of the window on the second page. What's the point of time-travel if one mission doesn't involve several different time periods in rapid succession? Maybe I'd have been better off meddling in the "Time Wars". In summary, the main rules are an excellent stepping off point into to time travel gaming, but it needs just a little more "tech" (it was lacking in the 80s), and a confident, flexible DM would probably have the most fun playing everything as the "exception to rule". The art in the main rules is less than inspiring - mainly Victorian wood-cuts - with a little more cut and paste Terry Gilliam would have had a run for his money. But it's still adorable as a complete old-style numbers and bonuses role-playing system. The prices of Goblinoid's Time Master products (at the moment) are very affordable. 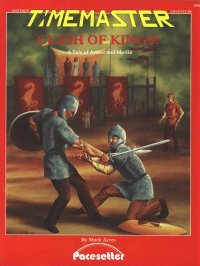 I also recommend the Clash of Kings -currently a mere $2- If only for the fact that you might you like reading about the possible origins of King Arthur in the suggested-real history of England. Throw in a trapped time traveller (Merlin, of course), some aliens in a cave, the Grail, the odd duel and battle, and you've got something just slightly more sophisticated than A Connecticut Yankee in King Arthur's Court (and all of those comedy films that followed, ye gods). But it could still be a lot of fun. The illustrations in Clash of Kings is from Beardsley's famous art for Le Morte Darthur, -a useful reminder of the influence the legends had on Romantic culture, which, according to the module are essential for the future development of England, Europe and the world. But don't worry, if everything fails .. "Communist North America and United Europe destroy the world in the Holocaust of 2054" (p32) Remember, kids, it was the 80's, with Reagan and Thatcher in charge you knew where you stood when it came to the future, my only question was, why wait that long? I also tried my hand at being a GM in Chill, also really fun, campy horror ftw.